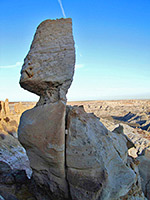 At 6,988 feet, Angel Peak is only a minor summit, rising just a little way above the high desert plains of northwest New Mexico, and sits in the middle of a rolling expanse of pastel-colored badlands, cliffs and dry washes, similar to the Bisti and De-Na-Zin wilderness areas 25 miles southwest - all are part of a general collection of eroded landscapes known as the San Juan Basin Badlands. The undulating scenery around Angel Peak lacks the great variety of hoodoos found elsewhere in the basin, so the place is not as good for hiking or photography, yet the region is peaceful, desolate and empty, well worth visiting for a few hours or staying overnight; most is protected as a BLM Scenic Area which has several excellent free campsites on promontories above the badlands. One reason for the lack of visitors may be the absence of signposts. The scenic area is 15 miles south of Bloomfield and a few miles east of US 550/NM 44, reached by a graded gravel track (county road 7175), but the turn-off is indicated only by one sign at the junction, not from any further afield. 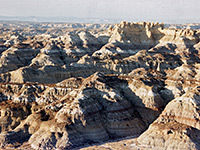 The side track reaches the first overlook of the badlands after one mile, then passes two further picnic sites/overlooks, before arriving at the campsite after 8 miles. 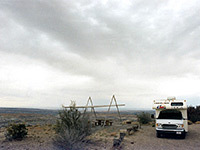 All four sites have pit toilets, fire grills and sturdy concrete table & chairs beneath metal sun shelters, and all are great places to stop overnight, especially evocative at dusk since as well as views over the grey, green and purple banded badlands, they are high enough to overlook many square miles of sagebrush-covered desert to the north and west, and at night the twinkling lights of far away Farmington, Aztec and Bloomfield are clearly visible. The views extend to the San Juan and Ute Mountain ranges in Colorado, over 60 miles distant. Apart from the whistling of strong prevailing winds, the sites are usually silent, disturbed only by faint but constant thumping from several compressors down below, part of oil and gas operations in this area. The campsite itself is also well situated, though a little further from the cliff edge. 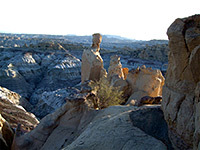 There are no developed trails down from the rim at the picnic site, but several paths lead into the badlands at the end of the road, through little twisting ravines and to the Angel Peak summit. Climbing down from other places is usually possible with care, though much of the terrain just below the rim is too steep and unstable. 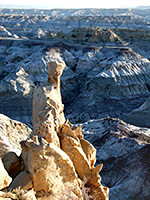 The badlands were produced by erosion of three strata; Kirtland Shale, the San Jose Formation and the Nacimiento Formation, and also contain large but isolated specimens of petrified wood, here an attractive grey-bluish colour. 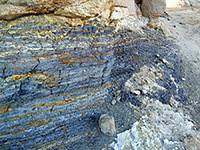 The barrenness of the terrain is due to high soil alkalinity and poor drainage, which prevents almost all vegetation. Location of badlands in the San Juan Basin. The nearest towns with hotels close to Angel Peak are Bloomfield (15 miles) and Farmington (25 miles).